AMD has been relatively silent on the topic of NVIDIA’s variable refresh rate G-Sync technology since its announcement last year. At this year’s CES however, AMD gave me a short demo of its version of the technology. 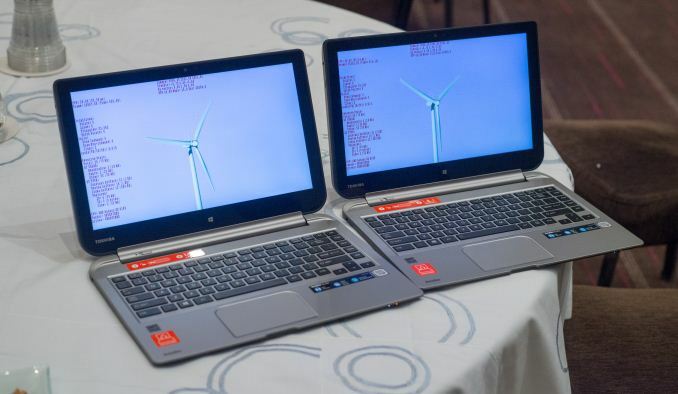 Using two Toshiba Satellite Click notebooks purchased at retail, without any hardware modifications, AMD demonstrated variable refresh rate technology. According to AMD, there’s been a push to bring variable refresh rate display panels to mobile for a while now in hopes of reducing power consumption (refreshing a display before new content is available wastes power, sort of the same reason we have panel self refresh displays). There’s apparently already a VESA standard for controlling VBLANK intervals. The GPU’s display engine needs to support it, as do the panel and display hardware itself. If all of the components support this spec however, then you can get what appears to be the equivalent of G-Sync without any extra hardware. In the case of the Toshiba Satellite Click, the panel already supports variable VBLANK. AMD’s display engines have supported variable VBLANK for a couple of generations, and that extends all the way down to APUs. The Satellite Click in question uses AMD’s low cost Kabini APU, which already has the requisite hardware to support variable VBLANK and thus variable display refresh rates (Kaveri as well as AMD's latest GPUs should support it as well). AMD simply needed driver support for controlling VBLANK timing, which is present in the latest Catalyst drivers. AMD hasn’t yet exposed any of the controls to end users, but all of the pieces in this demo are ready and already available. The next step was to write a little demo app that could show it working. In the video below both systems have V-Sync enabled, but the machine on the right is taking advantage of variable VBLANK intervals. Just like I did in our G-Sync review, I took a 720p60 video of both screens and slowed it down to make it easier to see the stuttering you get with V-Sync On when your content has a variable frame rate. AMD doesn’t want to charge for this technology since it’s already a part of a spec that it has implemented (and shouldn’t require a hardware change to those panels that support the spec), hence the current working name “FreeSync”. AMD’s demo isn’t quite as nice as NVIDIA’s swinging pendulum, and we obviously weren’t able to test anywhere near as many scenarios, but this one is a good starting point. The system on the left is limited to 30 fps given the heavy workload and v-sync being on, while the system on the right is able to vary its frame rate and synchronize presenting each frame to the display's refresh rate. AMD isn’t ready to productize this nor does it have a public go to market strategy, but my guess is we’ll see more panel vendors encouraged to include support for variable VBLANK and perhaps an eventual AMD driver update that enables control over this function. In our review I was pretty pleased with G-Sync. I’d be even more pleased if all panels/systems supported it. AMD’s “FreeSync” seems like a step in that direction (and a sensible one too that doesn’t require any additional hardware). If variable VBLANK control is indeed integrated into all modern AMD GPUs, that means the Xbox One and PS4 should also have support for this. Given G-Sync’s sweet spot at between 40 - 60 fps, I feel like “FreeSync” would be a big win for AMD’s APUs. It isn't the same thing. no offense but you must be an nvidia fanboy. scott wasson is one of the biggest nvidia famboys on the web! It's comical. On a recent podcast he actually admitted NVIDIA PURCHASED his website some retail R9 290's for some hit piece on AMD (the retail performance variability thing). That's right, he happened to "casually mention to contacts at Nvidia" (evidently he is somehow in constant contact with Nvidia I guess lol?) the piece I guess, and since he couldn't afford them, Nvidia offered to pay for the AMD cards for testing! I'm sorry, that just destroys any notion of website integrity..